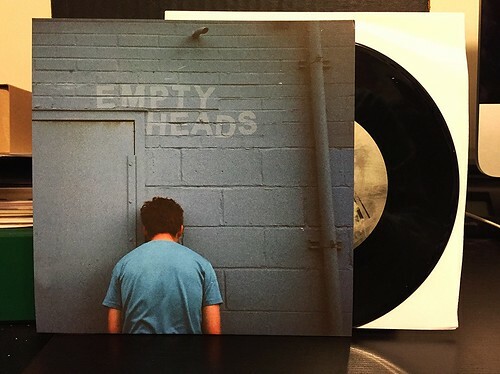 I Buy Way Too Many Records Dot Com: Empty Heads - Deceiver 7"
Debt Offensive sent me a few records to review along with a note that said "Not sure any/all will be up your alley." I can definitely appreciate that my taste in music can be a little weird. I'll like some bands that folks would automatically think I'd hate, but then I won't like others that seem like they should be my cup of tea. I can absolutely understand why this note was included with the first of the records I'm listening to, this Empty Heads 7". This is a loud, somewhat abrasive band. The vocals are buried under a mountain of fuzz and the guitars are muddy and thick. These are descriptors I would typically use as I would launch into an unfavorable review, but for whatever reason I really dig this 7". I think it all comes down to the fact that even though the band is loud, even though they are real distortion mongers, even though I really can't understand a word they are singing about, they never abandon the hook of the song. Each of the 7"s four songs are deceptively catchy. The band isn't just making noise for the sake of it. Hidden in each mess of a track is a wonderful little pop song just begging to rip out from the chaos. It's a surprisingly fun listen and I'm not positive I would have really given these guys a chance had the record not been sent to me. This is worth checking out, as long as you can handle a little noisy insanity.